Wanda Carter Roush, a mother to five and MiMi to three, has homeschooled her children for the last twenty plus years. A former Sunday school teacher and children’s church director, she has used stories of angels to communicate God’s love to children. The idea for Angel on Assignment came to Wanda while caring for her youngest daughter, who has severe epilepsy. While the Elf on the Shelf was fun, she wanted to instill a mysterious hope in her child’s heart that would last a lifetime. Wanda believes the angels catch the little ones when they fall and have caught her little one who “falls” often. Wanda’s hope is that this book would stir an awareness that angels are among us. Wanda Carter Roush is founder of National Give a Bunch of Balloons Month. The National Day Calendar proclaimed National Give a Bunch of Balloons Month to be observed annually in the month of June to celebrate another day with someone who has a terminal illness or a life altering condition. National Give a Bunch of Balloons Month delivers smiles to what might be a mundane day --"because every breath is a gift." The author leads the young reader through the story of the first Christmas: Mary’s visit from an angel, Joseph’s visit from an angel, the shepherds learning of the birth of Jesus from angels. These are important stories for young children to learn. But they also need to understand that angels are around them all the time, even if they can’t see them. Children need to understand and appreciate the depth of God’s love. This is an excellent addition to any young child’s library. Beautifully told. Angel on Assignment: Move Over Elf. It's Time To Share The Shelf is a Christian children's storybook written by Wanda Carter Roush and illustrated by Mike Motz. Who are the angels, and how did they come to know about the birth of Jesus Christ? While children and their parents read about angels and God in the Bible, angels are Heaven's messengers. An angel appeared to Mary to tell her that she would have a very special child, and Joseph learned of the event through an angel-inspired dream. Angels bring messages to children and adults, and they bring good news. Each child has an angel watching over them as they play, go to school and sleep at night. The author suggests that children be angels as well, by doing good deeds and helping others. She also includes in her book the materials needed and kid-appropriate detailed instructions for making angels at home, with adult supervision recommended. She gives readers ideas on how to make their angels especially perfect and have her watch over them at home. Wanda Carter Roush's Christian children's storybook, Angel on Assignment: Move Over Elf. It's Time To Share The Shelf, introduces angels to young children in terms that will allow them not only to understand what angels are, but to feel protected and loved by angels. Mike Motz's illustrations work quite well with the text, providing a wide variety of different angels for the reader. This is a comforting story for a young child, and would be an excellent bedtime story for those who still see bedtime as just a little bit scary. I especially enjoyed the section of the book that shows readers how to make their own angels. The author offers so many alternatives for each part of the angel that just about everyone will be able to make their own angel from things found at home. The dressing up your angel section of the instructions is bound to inspire creative efforts by all participants in the project. Angel on Assignment: Move Over Elf. It's Time To Share The Shelf is highly recommended. Did you ever wonder what angels are and where they come from? Would you like to work with God's angels? Angel on Assignment (An Elf Alternative) by Wanda Carter Roush is a cute illustrated children's book that describes all the amazing things angels do for us and where they come from. This is a charming book about how God created the angels. He designed them to help us. Their purpose is to protect and take care of us. The Bible tells us that they even announced Jesus' birth. When an angel comes to you, you don't have to be afraid. They are bringing you a happy message when they appear. Angels are with us all the time, even when we think we're alone. Who knows, when you help someone, you may be helping an angel! 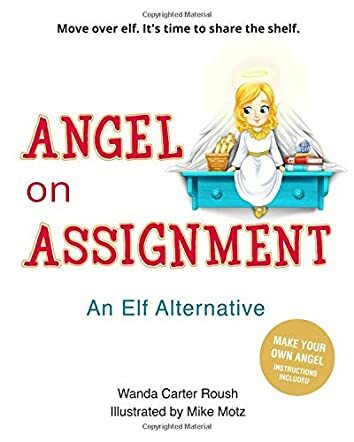 Angel On Assignment by Wanda Carter Roush is a wonderful Christian alternative for Elf on A Shelf. The illustrations are beautiful and engaging. The story is fun and has an endearing message for the Christian child. It touches on the birth and the death of Jesus, and shows how the angels rejoice when someone invites Jesus into their hearts. With a fun activity at the end of the book, children can feel closer to their angels as they create their angel assignment. Start a new family tradition and welcome angels into your home for the holidays! I recommend this book for the whole family as it is a fun, interactive angelic adventure, perfect for children and adults to read together.